Few painters prompt a comparison both to some of the giants of early Modernism and to the pioneers of Pop Art. Annette Rawlings has been compared to Modigliani on the one hand, and to Roy Lichtenstein on the other. Looking at her new work, it is easy to see that both of these references are exact, and that, in addition to Modigliani, one ought to cite Gauguin, Matisse, Fernand Léger and Diego Rivera. The interplay between the 'primitive' [a word one now has to put in quotation marks] and the industrial is a fundarnental part of the story of Modernism in art. It is a story that began in the immediately pre-Modern era, with the journeys made by Gauguin to Martinique and then to the South Seas. Matisse also traveled to Tahiti. He lived there for two-and-a-half months in 1930. Though he produced only one painting during his stay, he made numerous notes and drawings and the visit made a lasting impact on his art. The great Mexican painter Diego Rivera spent a decade living and working in avant-garde circles in Paris before returning to Mexico in 1921. His time away led him to look at his native country in a new fashion. His murals and paintings from this time forward celebrate both Mexican history and Mexican folk customs. He claimed that the murals were inspired by the wall-paintings made by Pre-Columbian peoples such as the Maya, but in fact they owed more to the Renaissance frescos he saw on a visit made to Italy in 1920. He was strongly influenced by the work of Piero della Francesca, which he saw in Arezzo. He was able to combine this experience with his previous experience of Cubism. If one aspect of Cubism was its fascination with the primitive-particularly in this case tribal African art-another was its interest in the modern mechanical world, and particularly in machine forms. This interest manifested itself particularly clearly in some of the paintings that Léger, a pioneer member of the Cubist group, made in the 1920s. Roy Lichtenstein, who was a great paraphraser of the work of other artists, made a long series of paintings that seem to refer to this phase of Léger's activity. Rawlings seems to have looked at and learned from this whole complex development. Figures from Mexico - Merida, 2005, Oil on linen, 36" x 48"
When one looks at her work, one sees the flat color areas and radical simplification of forms characteristic of the late output of Matisse, and especially of his final series of large-scale paper collages. One also sees something that seems to come from one of the great unclassifiable of American 20th century art, Milton Avery. One also sees an interest in the apparently harsh mechanical lines that Lichtenstein borrowed from comic strips. What makes the paintings work is their very firm sense of design- the way in which the lines and flat color-areas relate both to one another and to the bounding edges of the composition. 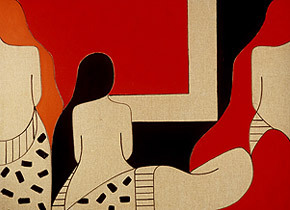 In a painting such as 'Figures from Mexico-Merida', simplification is pushed as far as it can go, while still leaving the subject recognizable. This means that we react to the painting in two different ways-first as pure design, second as a comment on something actually seen in the 'real world'-which in this case means in the world outside the painting. The ambition of every contemporary painter is in fact to produce work that is as far as possible self-sufficient-that requires no recourse to information outside of itself. Rawlings very nearly succeeds in doing that. These paintings are calm, beautiful entities, which can be enjoyed purely on their own terms. Yet it does add something to them, I think, if one places them in the grand tradition of hedonistic Modernism to which they undoubtedly belong in a historical sense. Edward Lucie-Smith is best known as a writer of books on contemporary art. His titles include Movements in Art Since 1945, Art Today an Art Tomorrow. He is also an exhibition curator, poet and internationally exhibited photographer. Donatella, 2004, Oil on linen, 42" x 58"
The four painters in this show used a wide variety of materials and techniques in their large-scale works, but what most distinguished their paintings was their close focus on the topography of the human body. In the oil on rough linen works by Annette Rawlings, images appeared pixilated, a la Roy Lichtenstein. 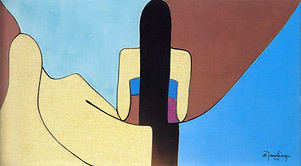 The hair and torsos of her cartoon-like women break down into panels of primary colors, creating a grid of various shapes.